Apple has released its Q4 2016 financials, which mark the third straight quarter of year-on-year revenue declines. Furthermore, it has suffered its first decline in annual sales and profit in 15 years. Headline figures were: quarterly revenue of $46.9 billion and quarterly net income of $9 billion, or $1.67 per diluted share. 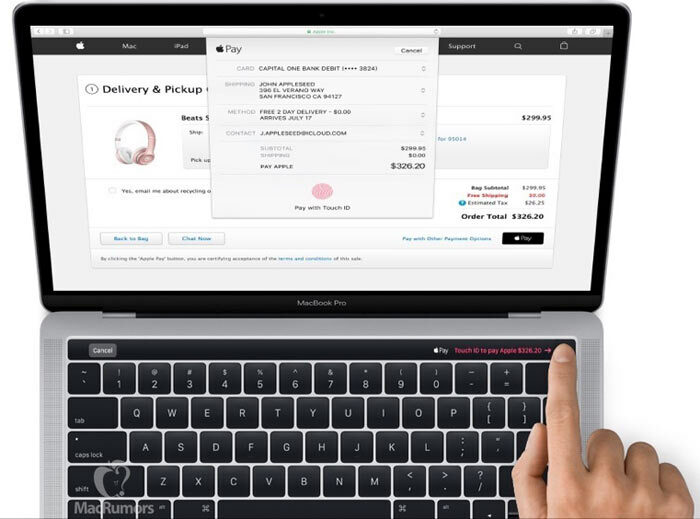 In Q4 2015 Apple brought in $51.5 billion and net income of $11.1 billion, or $1.96 per diluted share. Nevertheless Apple headlined its results claiming "Services revenue grows 24 per cent to all-time quarterly record of $6.3 billion". In afterhours trading Apple's share price initially rose, but as people read past the headline shares have dropped by 3.5 per cent at the time of writing (see chart below). Apple's hardware sales fell by 8 per cent compared to a year ago. Most of the impact came from dwindling iPhone sales which is by far Apple's most important product. In Q4 2016 (which ended 24th Sept 2016) Apple sold 45.5 million units which was better than analysts expected but 5 per cent down on the same period last year. 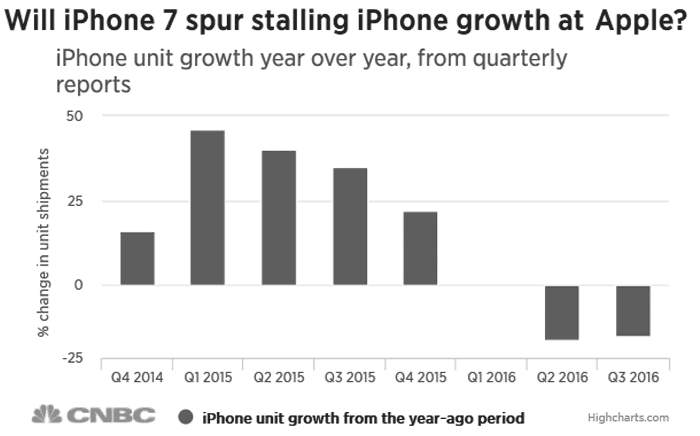 Investors hope that the iPhone 7 impact will be felt strongly in the coming quarter, which includes the Xmas season (remember it only started to ship mid-September). 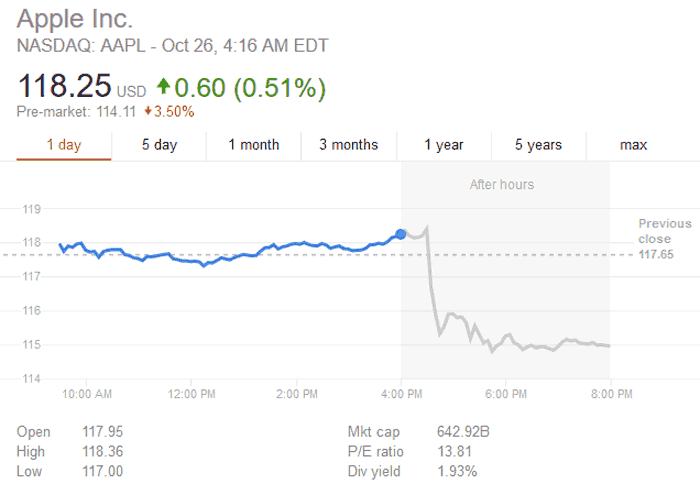 If you look at the graph above, via CNBC, you can see the trend that Apple has to turn around. However, early noises from Tim Cook in the statement to investors yesterday are positive: "We’re thrilled with the customer response to iPhone 7, iPhone 7 Plus and Apple Watch Series 2, as well as the incredible momentum of our Services business, where revenue grew 24 percent to set another all-time record," wrote the Apple CEO. Regular readers and Apple watchers will know that Apple is holding a special event tomorrow, where many expect there will be new Macs on show. We saw the official invites go out last week, asking members of the tech press to attend the Apple Campus in Cupertino. Apple Arcade and Apple TV+ streaming services launched Turtle Beach is buying Roccat for $19.2 million Nvidia technical marketing boss Tom Petersen moves to Intel Apple apologises over continued butterfly keyboard woes Apple launches iMacs with "2x performance boost"
Sales dropped 30% in China because of the state of the economy there “which is totally fine” if you believe the state media (lol) but the other part is for some Chinese brands the race to the bottom is a dead end are now targeting Apple at the high end. I think there is definitely a degree of fatigue as well in general with all Apple products, there's almost no reason at all to buy a new iPad these days. I don't think Samsung's woes are Apple's fortunes either, Samsung owners were people heavily invested in Google ecosystem, they arent going to jump ship to Apple. 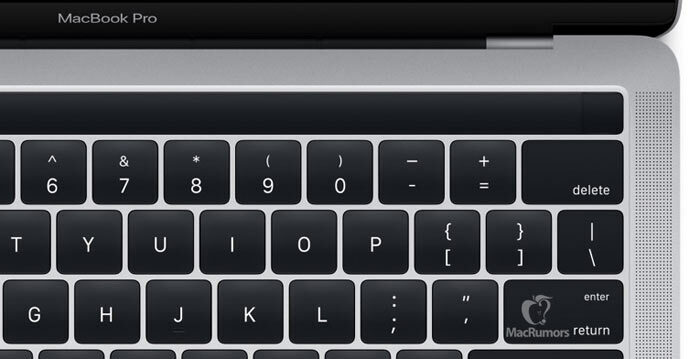 the creativity at apple is declining. Its all relative though - Apple is still making mega profits which have tended to be increasing YoY. That is good going for nearly 15 years in the face of a shrinking PC market and a stagnating phone and tablet market and the financial crisis in 2008.